There was an excellent session at the Midyear entitled “Infectious Diseases Update: Using Guidelines to Optimize Treatment”. Dr. Michael Ryback spoke about the “Implications of the Vancomycin Consensus Guidelines”. He pointed out the shortcomings of the 2009 guidelines, specifically those patient populations who were omitted from the guidelines, obese patients being the largest omission (pun intended). Dr. Ryback is on the panel currently revising these guidelines and he spoke about some of the changes the panel are considering. 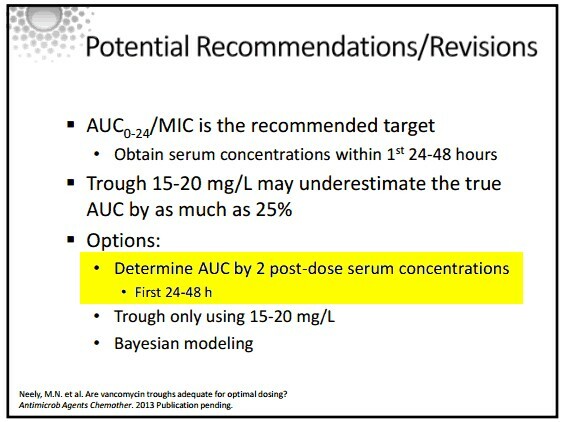 Most interesting to me was the (possible) recommendation to draw two post-dose serum levels following the loading dose. To which I say a resounding yes. 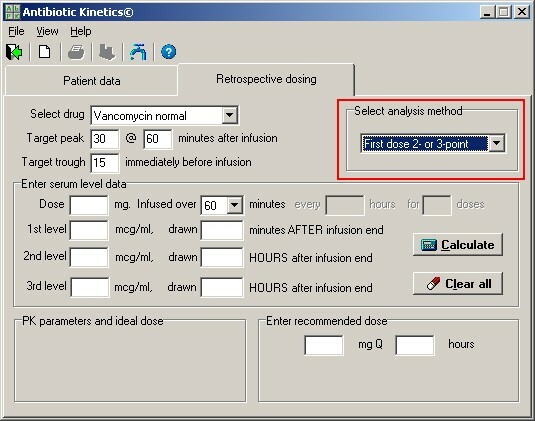 Considering the large interpatient variability in Vancomycin pk, why “guess” what a patient’s dosing requirements might be? Why wait 2-3 days to find out if your recommended dose is therapeutic or toxic? And then fiddle around for days with dose changes and more levels. With two levels following the loading you can nail down the patient’s vancomycin pk right off the bat. Home run. Usually when I mention this as a solution to a younger pharmacist, I either get that “you’re crazy” look or a blank stare. Apparently these things have to come down from a mountain, carved into stone tablets. Or, at the very least, from someone with a half dozen initials behind their name. Sheep go to heaven, while goats go to hell (or at least exiled to the graveyard shift). Regardless, this type of pk analysis is actually the original Sawchuck and Zaske method for gentamicin dosing, from 1977. All but forgotten except for a few devotees. 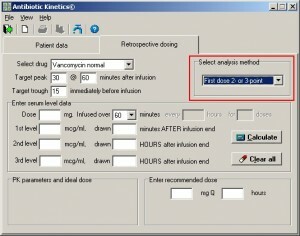 Kinetic model for gentamicin dosing with the use of individual patient parameters. 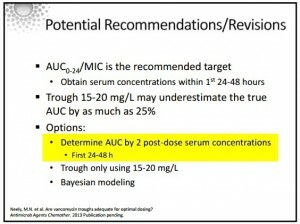 I certainly hope this recommendation makes it to the new Vancomycin consensus document. Or, at least, it opens the eyes of some of the braver sheep.